For the exhibition in Grenchen, Sebastian Utzni translates his schematic illustration of an antique memory model, as recorded by hand, into a multi-part illumination made of fine neon lightbulbs. From the start the glowing letters mounted on a reinforcing mesh placed vertically in the space determine the way the exhibition is read. The unusual method of mounting the works allows a view of the different works shown and at the same time demonstrates the individual parts of the model. 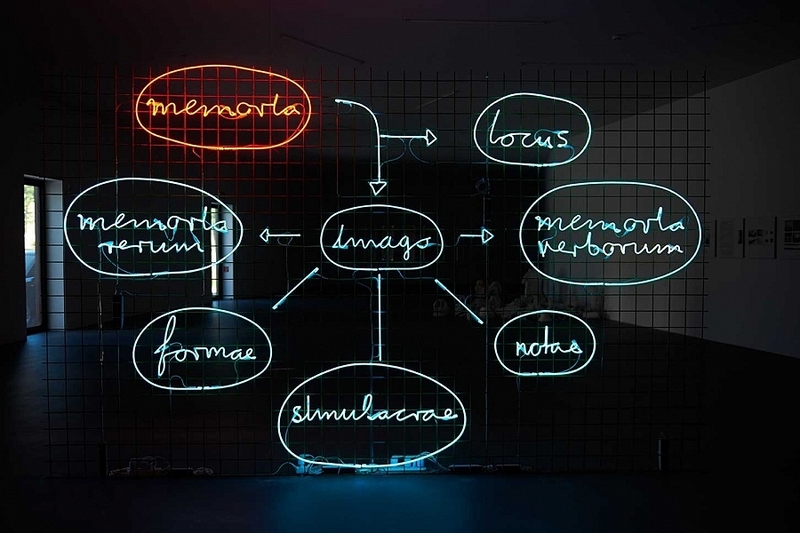 With his choice of the neon medium Utzni achieves a playful exchange between memories of commonplace night-time urban images, marked by illuminated advertising, and important art historical works such as those of Bruce Nauman or Lucio Fontana, who was already working in neon in the mid 20th century. With this striking signal he activates our memory and equally reveals his frame of reference. Memory is subjective and individual. Memory is general and collective. How do we remember? Are there means of increasing our ability to remember? When does memory deceive us? German-born Sebastian Utzni knows about the power of memory and the dangers of forgetting. 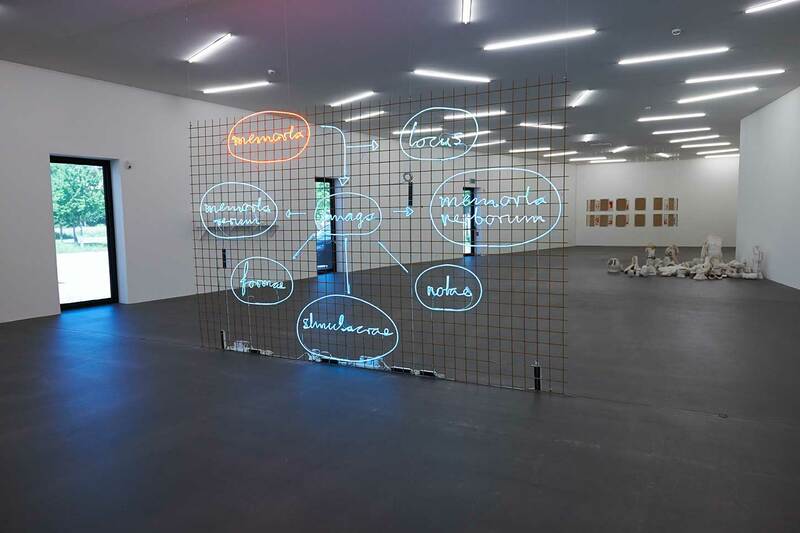 For his first institutional exhibition, at the Kunsthaus Grenchen, the artist creates works using a memory model from antiquity. Going in search of memory, he bridges the past and the contemporary. In the process he is as interested in instances of tyranny and their protagonists as he is in the mechanisms of the current and historic art system. Documents and evidence of (art)historical events, such as photographs, paintings or texts, are the starting point for his works, which are often produced in series. The pictorial engagement with experience is generally linked with a medial shift: originally printed materials are translated into painting, or the ‘fast’ photographic medium gains a counterpoint in slowly produced woodcut and sometimes an immersive installation grows from a story. In his conceptually driven work Sebastian Utzni sets himself a framework of conditions within which he must operate during the work’s creation process, often lasting several months. Through in-depth engagement with a given exhibition space the artist himself begins to record stories and history.